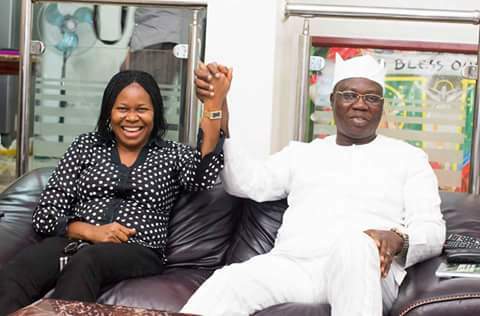 On arrival to Lagos, after his historic installation as the 15th Aare Ona Kakanfo of Yorubaland, Aare Gani Adams today hosted the President and management team of the Women Arise and Centre for Change, at His Lagos Home. The visit, led by the President of Women Arise, Dr Joe Okei Odumakin, was to congratulate the new Aare Ona Kakanfo, who she described as a symbol of liberation, and the struggle for an equitable society. Dr Odumakin also commended His Imperial Majesty, Oba Lamidi Adeyemi, the Alaafin of Oyo, over the choice of Aare Gani Adams, describing it as a candidate chosen from the people, and not from a group of elite. In his response, Aare Gani Adams, paid glowing tributes to Dr Joe Odumakin, describing her as a woman of unequalled courage and commitment to the cause of humanity. Aare Adams promised to sustain his relationship with the civil society movement, while also assuring of his continued support to the activities of the movement, especially those that has been championed by Dr Joe Odumakin over the years. The visit was also witnessed by officials of Oodua Progressive Union from all over the world, who were present at the residence of Aare Gani Adams, during the visit.